This is a preview of an upcoming movie. 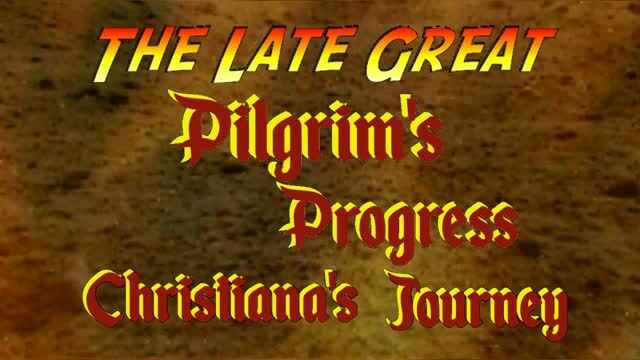 The Late Great Pilgrim's Progress, Christiana's Journey. This is a family project that is being worked on at a slow but steady rate. The finished movie should be posted at https://www.nancys-world.com/the-pilgrims-progress . Anyone in the New England area interested in taking part in this project as a stand in or as a character actor please PM me. The Pilgrim's Progress is a Christian allegory written by John Bunyan in 1678. This story was based on a series of dreams Bunyan had when he was jailed for preaching the gospel. This book has been translated into more than 200 languages, and has never been out of print. Christian, the central character in the story, journeys from the City of Destruction to the Celestial City. Along the way he faces many dangers and obstacles. This story closely resembles many of the life experiences Christians have pre and post conversion on the road of life, the pitfalls and dangers faced in the lives of many Christian believers who are on the same journey. This movie is loosely based on Part II of The Pilgrim’s Progress where Christian’s wife ( Christiana ) follow in the footsteps of her husband, the plot of this movie incorporates some of the events from part 1 and presents present modern day scenarios into this classic story. Persons donating $20.00 or more to this project and/or participating in the making of this movie are eligible to receive a hard copy of the finished movie at no cost. This movie project is a not for profit venture and is intended to promote the cause of Christ. Interested in being a part of this project ?